Jesus is the Son of God and very human and yet very God, so how human was Jesus? Jesus was called the Son of God frequently in the New Testament, but does this mean that Jesus only became a Son after His physical birth? No, that’s not what the Bible teaches. Jesus is referred to as the Son of God but also the Son of Man, both, Old Testament references to God, and Jesus once told the religious leaders, “before Abraham was, I am” (John 8:58), and that’s why they were so outraged, so “The Jews insisted, ‘We have a law, and according to that law He must die, because He claimed to be the Son of God’” (John 19:7). The Jews understood that He was making Himself out to be equal with God, and Jesus never corrected them, because He is God and co-equal with God. It is only in His submission to the Father’s will that He places Himself, but just like a wife submits to her husband but she is still a co-equal and co-heir before God. I tell myself, it’s not “Behind every successful man is a good woman,” but “Beside every successful man is a good woman,” or he’d probably not be so successful. I can testify that I could not do half of what I do for the church without my beloved wife being at my side, working along with me, mostly on our knees. The point to all this is Jesus was equal with God because He was God. He is God and has always been God. You can’t be God and have a starting point, meaning Jesus was not created, but has existed, always. My tiny human brain can’t comprehend that, but I know it’s true, just like I can’t fly a 747 but I know it flies. Jesus was said to be both Man and God, because He had the capacity to toil, sweat, bleed, and suffer from hunger, cold, and thirst. The author of Hebrews brings out the point that He makes the perfect High Priest because He has felt abandonment, suffered pain, known heartache, and endured all of the aches and pains of being human, so “we do not have a high priest who is unable to sympathize with our weaknesses, but one who in every respect has been tempted as we are, yet without sin” (Heb 4:15). And speaking of Jesus’ humanity, Matthew wrote of His being born of a woman, a virgin, not inheriting the sin nature through Adam or man (Matt 1:21-23; Gal 4:4), He had sisters and brothers and a mother (Matt 13:55), He was wrapped up in swaddling clothes like any baby would have been (Luke 2:7), and He had a physical family lineage that led back to King David, and in fact, all the way back to Adam (Matt 1:1-16; Luke 3:38). Clearly Jesus was God but He was also human, so how can someone be both God and Man? Don’t look at me to explain the inscrutable God! A very poor analogy would be that I am an American, but I am also a Kansan, so I am both an American and a Kansan; both, at the same time. So I can be both 100% Kansan and 100% American at the same time. I know it’s a poor analogy, but we know from Scripture that Jesus was fully God and after Bethlehem, fully human. After His resurrection, He was able to eat in the presence of His disciples (Luke 24:42), but also able to pass through walls (Luke 24:36-37). That is the body that every believer will have after the return of Christ, for some day, “Beloved, we are God’s children now, and what we will be has not yet appeared; but we know that when he appears we shall be like him, because we shall see him as he is. 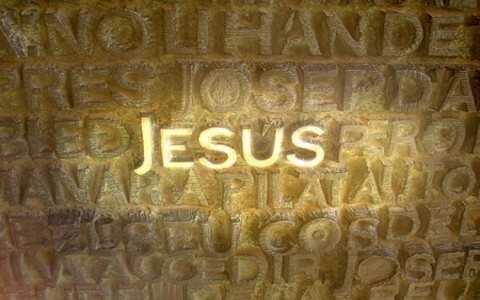 And everyone who thus hopes in him purifies himself as he is pure” (1st John 3:2-3). That means you’ll still see the pierced hands and feet of Jesus, just as Thomas did, and proclaimed, “My Lord and My God” (John 20:28). In the Garden of Gethsemane, we see a very vivid portrait of Jesus’ humanity as He prays three times to have the cup of Calvary removed, yet He still submits to the Father’s will. How many times in our lives have we refused a cup of suffering on behalf of Christ, and not taken that cup? Speaking to myself, it’s far too many times for me to count, so in the Garden, Jesus clearly did not feel like going to the cross, but I don’t think it was the suffering that He dreaded…it was taking upon Himself the sins of the world. Jesus Christ, sinless and holy, became sin for us (2nd Cor 5:21), but it penetrated His soul to the point that He sweat drops of blood. Luke the Physician records just how much Jesus was “in His anguish, He prayed more earnestly, and His sweat became like drops of blood falling to the ground” (Luke 22:44). It would be like exposing a young child to the most horrific things imaginable. It would be repulsive to them, and so the sins of the world were to Jesus, because He was sinless. Jesus had to become sin for us, but that’s 100% contrary to His very nature. I believe Jesus dreaded the cross because He would drink of the cup of the vilest and most heinous of sins of all mankind, ours included. In Jesus’ humanity, He suffered the blows and endured the nails on the cross, so that we might be saved by Him. The Apostle Paul writes about Jesus’ humanity, that “when the time had fully come, God sent his Son, born of a woman, born under law, to redeem those under law, that we might receive the full rights of sons” (Gal 4:4-5). If Jesus had not existed prior to Bethlehem, as some cults teach and say He was created, then why does it say God “sent His Son?” How could He send His Son if He had not been created yet? Clearly, Jesus has as much humanity as He had God; both wholly God and wholly Man. He had a mother, brothers and sisters, felt pain, died on the cross, but the difference was, the grave couldn’t hold Him, because since the wages of sin is death (Rom 6:23), and Jesus had no sin. He only took upon Himself our sin. That’s why the grave couldn’t hold Him. Speaking of Jesus, the Apostle Peter, on the Day of Pentecost, proclaimed that “God raised him up, loosing the pangs of death, because it was not possible for him to be held by it” (Acts 2:24), and you too can be raised together with Christ if you’ve been brought to repentance and put your trust in Christ. Read more about Jesus here: How Was Jesus Described in the New Testament?